Phoenix canariensis is a species of flowering plant in the palm family Arecaceae, native to the Canary Islands. It is a relative of Phoenix dactylifera, the true date palm. It is the natural symbol of the Canary Islands, together with the canary Serinus canaria. Mature P. canariensis are often used in ornamental landscaping and are collected and transplanted to their new planting location. A Canary Island Date Palm with 10 m (30 ft) of trunk is approximately 60 years of age. Common names in English include Canary Island date palm and pineapple palm. The common name in Spanish-speaking countries and in the Canary Islands is palmera canaria. 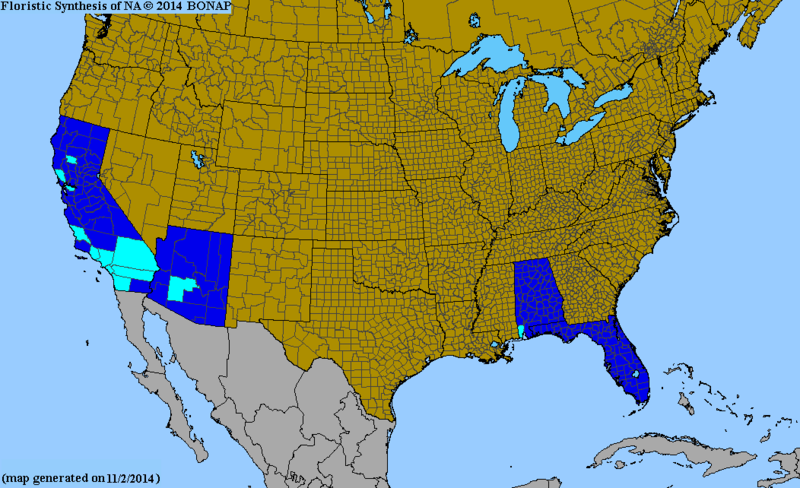 The approximate range of cultivation for Canary Island Date Palms in the US with little to no winter protection. The Canary Island date palm is typically cultivated in wet-winter or Mediterranean climates, but also in wet-summer or humid subtropical climates like eastern Australia and the southeastern United States. There are even several instances of cultivated Canary Island Date Palms in high-latitude oceanic climates, such as Ireland, the UK, and the Channel Islands. It can be cultivated where temperatures rarely fall below −10 or −12 °C (14 or 10 °F) for extended periods, although it will require some protection if cold periods are longer than normal. It is a slowly growing tree, exclusively propagated by seed. The Canary Island date palm is susceptible to Fusarium wilt, a fungal disease commonly transmitted through contaminated seed, soil, and pruning tools. Spread of the disease can be reduced when pruning tools are disinfected before use on this palm. In some areas, Phoenix canariensis has proven to be an invasive plant. In Bermuda and the United States (Florida and California) it is considered naturalised (lives wild in a region where it is not indigenous). It has also spread in some areas of peninsular Spain, Portugal, Italy, Australia, and New Zealand. It is listed as invasive in California. In Auckland, New Zealand, the palm has itself become a host for the naturalised Australian strangler fig, Ficus macrophylla. P. canariensis fruit in Northern Florida. ^ Beech, E. (2017). "Phoenix canariensis". The IUCN Red List of Threatened Species. IUCN. 2017: e.T13416997A13417001. doi:10.2305/IUCN.UK.2017-3.RLTS.T13416997A13417001.en. Retrieved 22 May 2018. ^ "BOC - 1991/061. Viernes 10 de Mayo de 1991 - 577". Gobcan.es. Retrieved 19 January 2018. ^ "Palms in the Channel Islands – by Michael A.F. Carter". The European palm Society. Retrieved 12 December 2013. ^ "Canary Island Date Palm - Phoenix canariensis - A-E - Palm Blog". realpalmtrees.com. Retrieved 19 January 2018. ^ "RHS Plant Selector - Phoenix canariensis". Apps.rhs.org.uk. Retrieved 25 May 2013. ^ "World Checklist of Selected Plant Families: Royal Botanic Gardens, Kew". Apps.kew.org. Retrieved 19 January 2018. ^ "Bonap" (PNG). Bonap.net. 2004. Retrieved 19 January 2018. ^ "Phoenix canariensis - Species Page - APA: Alabama Plant Atlas". Floraofalabama.org. Retrieved 19 January 2018. 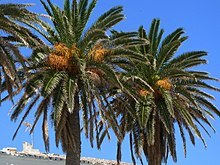 Wikimedia Commons has media related to Canary Island Date Palm. "Phoenix canariensis in the wild". Principes (Journal of the International Palm Society). 42 (2). April 1998. Retrieved 18 May 2008. This page was last edited on 15 February 2019, at 01:37 (UTC).